While the company is gearing for a rebound in 2016, its stock could still get cheaper before that happens. During the past year, Halliburton's (NYSE:HAL) stock is down roughly 20%, due largely to the continued weakness in the oil market. The company thinks that the weakness will come to an end in 2016 because it believes that the oil market will rebalance, which will lead to higher oil prices and a rebound in oil-field service activities. Despite this outlook, the stock could have further to fall before the eventual rebound takes shape. Here are three catalysts that could push its stock lower. This is because the price of oil has a pretty strong correlation to oil and gas activities. When oil falls, it slows activities, which impacts the volume of work that's sent Halliburton's way. Further, when oil prices are falling, oil companies demand service price concessions from service companies, which puts pressure on Halliburton's margins. 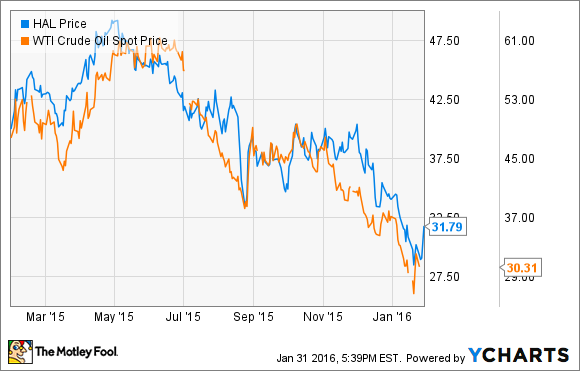 If oil keeps going lower, investors can expect Halliburton's stock to follow suit. Halliburton and Baker Hughes have had a real tough time convincing regulators that their merger won't stifle competition. To alleviate these concerns, Halliburton has proposed a number of asset divestitures, but it has yet to find the right combination to sufficiently address these concerns. Because of this, there is growing concern that the company might not be able to satisfy regulators, who could move to block the deal. Such a move would cost Halliburton big time. First of all, it would cost the company a hefty $3.5 billion break-up fee, which was set at approximately 10% of the deal's value, and is more than double the average break-up fee. Further, the company would lose out on the significant future potential it saw by merging with Baker Hughes, including cost synergies of nearly $2 billion on an annualized basis once fully integrated. With billions at stake, if this deal were to fall apart, it would likely cause a big drop in Halliburton's stock price. In Halliburton's view, once oil prices begin to rebound later this year, it should lead to an immediate increase in oil-field service activities, as it expects its customers to immediately reinvest any excess cash flow into more wells. It's a view that's not shared by everyone in the industry, with chief rival Schlumberger (NYSE:SLB) not expecting a rebound in oil-field activities until 2017. Schlumberger expects that oil companies will use any excess cash flow generated by higher oil prices to repair their balance sheets. If Halliburton is wrong about the timing of the recovery, it could have a big impact on profitability. Halliburton will likely increase its staffing level once it sees oil prices begin to improve in anticipation of a rebound in activity. However, if activity level improvements don't coincide with higher oil prices, it would put pressure on Halliburton's margins, and cause it to potentially deliver weaker-than-expected earnings. Investors would likely punish such a misjudgment by selling off the stock. Halliburton has a number of risks that could cause its stock price to continue falling. The biggest is the risk that the Baker Hughes deal falls through. Not only would that be very costly in the near and long term, but it would likely alter the thesis for investors.